This podcast discusses and shares personal information that discusses sexual abuse that may not be appropriate for younger children. Molly talks about how family secrets can be destructive and carry on from generation to generation. She shares how you can take a family secret and make a choice to no longer allow it to continue. 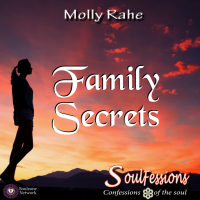 Molly shares a family secret that happened to her. She explains how keeping the secret affected many generations in her family. Molly’s courage to tell the secret gave her the ability to go through the stages of emotions to heal. Through the healing process, Molly was able to see the family secret from a different perspective. When you live in fear and denial, you are unable to see the situation for how it looks. By not being able to see the situation you cannot be honest with what’s going on. If you cannot be honest with what’s going on you will continue to stay stuck in the experience. Molly talks about forgiveness, changing the pattern of behavior and making a different choice. She offers ways to release painful secrets and feelings. We have the choice, to tell the truth. We have the choice, to be honest. We have that choice to feel. We have the choice to reach out for help. Are you ready to make that choice?